While being hypnotized by Dr. Morey Bernstein (Louis Hayward), housewife Ruth Simmons (Teresa Wright) experiences a past life as Irishwoman Bridey Murphy. In 1956, Dr. Morey Bernstein published a best-selling book about his experiences with the medical use of hypnosis, as well as his unintentional past-life regression of housewife Ruth Simmons into a 19th century Irishwoman named “Bridey Murphy”. This film adaptation of Bernstein’s book comes across as overly talky and hopelessly dated (when Simmons asks her husband for “permission” to be regressed, for instance, nobody bats an eye), yet surprisingly entertaining in its own limited way. Regardless of your beliefs concerning the possibility of past lives, it’s fascinating to watch the supine Simmons — well-played by a short-haired Teresa Wright — conjuring up the mundane details of “her” existence 150 years earlier. Simmons’ words are taken directly from the original transcripts of her sessions with Bernstein (published in the book), and are all the more convincing for their lack of overt drama — Simmons-as-Murphy “remembers” dancing a jig, being punished for peeling paint off her bed as a child, and wandering the heavens after her death. 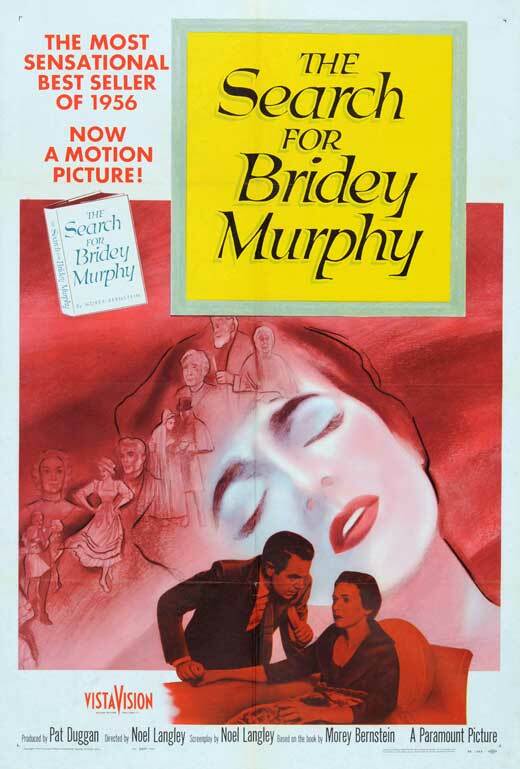 Unfortunately, despite its title, very little time in the film is spent actually searching for “Bridey Murphy”; given the wealth of details Bernstein pries out of Simmons, I expected a lengthy detective hunt in Ireland, and some kind of a resolution (however dissatisfying) to the mystery of this young woman’s existence. Instead, the film’s denouement centers on the melodramatic issue of whether or not Simmons will be able to snap out of her final regression — thus emphasizing once again the film’s moral that hypnosis is a “powerful force”, and not to be taken lightly. No. This curiosity is very much a product of its time, and will only be of interest either to fans of Teresa Wright or believers in past life regression. First viewing. I’m going to have to give this points as a must for its unique place in cinema history. It has a low-budget yet quietly persuasive feel to it. ~and that’s putting aside whether or not you buy that it’s a true story – which is almost beside the point. ‘TSFBM’ tackles subjects of interest to many of us; there could be few among us who aren’t intrigued by where we may have been before our present existence or where we may be going. You may not believe in past-life regression or reincarnation (and it doesn’t matter), but the film does make a strong-enough case for them that you’ll certainly have to ponder them. At any rate, you won’t have to be convinced of the power of the mind – or hypnosis. (I’ve known people who have stopped smoking as a result of being hypnotized, and have often been in awe of that kind of mind-altering force.) As well, the film contains a refreshing take on the afterworld – as a kind of rest-stop, neither negative nor a cotton candy depiction filled with guardian angels on standby. I admire the film for having important issues to place before us for consideration and discussion. From the little I knew about it (and it is certainly a little-talked-about film), I was prepared, for some reason, to not like it. Surprisingly, I found it a compelling watch. Wright’s ‘dual’ performance stands out as one of her most natural ones. She comes off as being quite real in both realities.